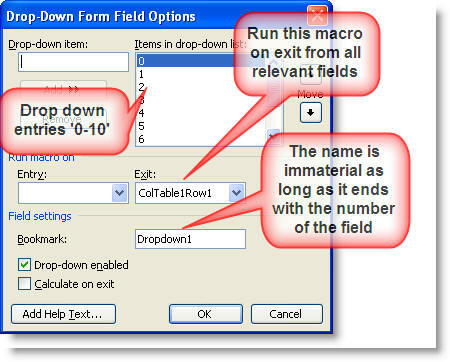 Each of the dropdown fields in column 1 of the table is configured similarly (create one and copy/paste the remainder). The drop down entries are numbers 0 to 10, and the macro ColTable1Row1 is run on exit from each. The illustration shows the default field bookmark name of Dropdown1. The bookmark names of the fields are immaterial as long as the final character is a number from 1 to 4 to reflect the row of the table. This number is used by the macro to fill the correct row of the table. lbl_Exit: 'Re-protect the form and apply the password (if any). In the following example a user wished to provide a variable number of fields and associated formatted text dependant on a figure input into a form field, as in the following illustration. 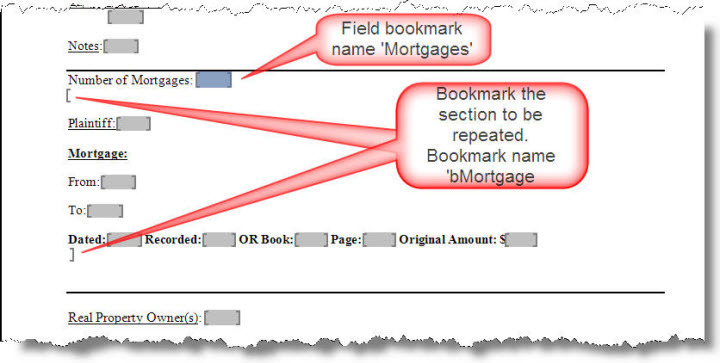 For the purpose of the exercise, the control field 'Mortgages' was set as a number field, the following macro was run on exit from that field, and the section to be repeated was bookmarked with the name 'bMortgage'. Note that some of the text is underlined, some is emboldened and some both underlined and emboldened. There are eight fields in the selection, each of which will be provided with a new bookmark name. The bookmark names of the fields in that marked section will be replaced by the macro, with the names "MortTextn" where 'i' is a numeric digit from 1 to 8. Subsequent iterations will be numbered from 8 - 16, 16 -24 etc. The user may return to the Mortgages field and change the number and the number of entries will be readjusted to take account of that changed number. In the illustration, bookmarks are displayed to aid understanding. 'The selection has moved down the page. Redefine the end of the range object. Colour a form field check box with a contrasting colour when it is checked. 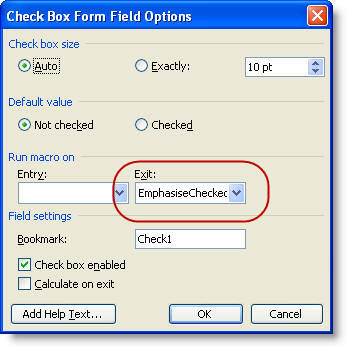 In the following illustration the checked form field check box is coloured red. This can be achieved by checking the value of the check box and formatting the check box when the value is 'True'. The following code uses the function Private Function GetCurrentFF() As Word.FormField used in the Bar Chart example above to get the current field name, so that the same macro can be applied to the On Exit property of each check box field. 'Re-protect the form and apply the password (if any). A user in a Word forum asked how to total the number of times associated with documented sound bites grouped in sections, similar to that shown in the illustration below. The macro below will count all the times in the format HH:MM:SS in the section where the cursor is located. Format(sSec, "00") & " Seconds"
There is no function in Word to transpose the order of two characters - a function that has been available in some word processing software since before Windows found its way onto the home computer. The following macro attached to some suitable keyboard shortcut will correct that omission. The macro works with either two selected characters or the characters either side of the cursor. The macro also takes account of the case of the transposed characters. If the first character to be transposed is upper case and the second not, then after transposition the first character will be upper case and the second lower case. Where both or neither characters are upper case, the case of the characters is retained. "the 2 characters to be transposed!" Msg2 = "There are no characters to transpose?" Msg3 = "There is no document open!" When you request an autotext entry, looks into the active template first, then in add in templates and finally in the normal template. This appears rather complex to arrange with VBA. While you can insert an autotext entry using VBA from the attached (active) template or from the normal template, if it is present relatively simply, provided you know its location and it is present. The problems arise when the location is not known or may not be present. The following macro first checks whether the document template is the normal template. If it is not, then the document template is checked for the entry. If it is or if the entry has not been found, the macro then checks all installed add-ins. Finally, if the normal template was not checked in the first step, it is now checked. If the entry is found in any of these locations the entry is inserted and the macro quits. If not the user is given a message to that effect. Word 2007 introduced building blocks which added a whole lot of other parameters and a separate building blocks template where autotext entries could be stored. Provided the autotext entry that you wish to insert is defined in the autotext gallery (or it is included in a Word 97-2003 format template or add-in, then the first macro will work as it stands. If you want to check all the galleries, then you will need some extra code. In addition to checking the active template, add-in templates and the normal template, the second macro looks in the building blocks.dotx template. It is to be hoped that if you are using VBA to insert entries, you might have a better idea of where they are stored beforehand, but the macro below should do the trick wherever they are. Const strBuildingBlockName As String = "Building Block Name"
'and if found, insert it. Send the current document from Word by e-mail as an attachment, with the header details pre-completed, e.g. for the return of a completed form document.